Many associate Massachusetts with the Kennedy family, and its influence is evident at Battleship Cove. The World War II record of the Kennedys is a distinguished one. Lieutenant John F. Kennedy, who would later become president, was nearly killed fighting the Japanese in the South Pacific. Fittingly, an exhibition hall holds two PT boat specimens. PT 617, the type on which Kennedy served, is the last surviving Elco-class ship in existence. 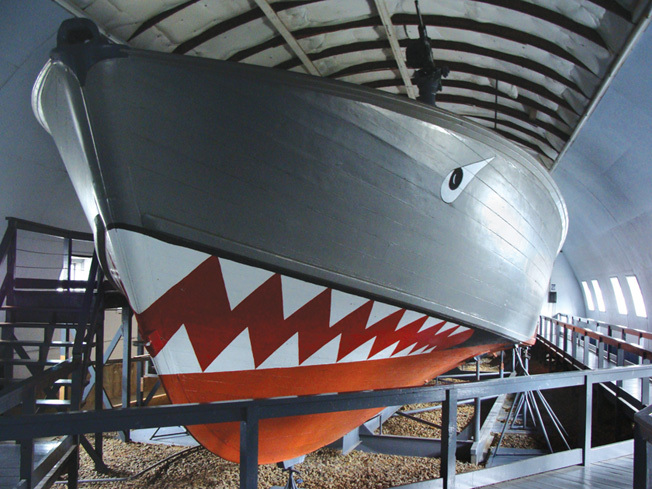 PT 796, painted with menacing shark teeth on its bow, was the product of the famous Higgins shipyards in New Orleans. Both of these were constructed in 1945 but never saw combat.The New England coast is studded with countless bays and coves. One of these watery inlets, known as Battleship Cove in Fall River, Massachusetts, is home to a floating museum complex that holds some priceless World War II treasures. All the ships on display here but one—the Soviet-built missile corvette Hiddensee—date to the Second World War. The State of Massachusetts has a long and distinguished naval history, and most of the vessels have a Bay State connection as well. One of the most impressive displays is the PT boat exhibit. Usually associated primarily with the Pacific, these small, plywood boats actually saw service in European and Mediterranean waters as well. They were organized into squadrons of about 15 boats. In the Battleship Cove exhibit, each squadron has its own display case housing photos, news clippings, and other souvenirs the sailors brought home and later donated to the museum. The exhibit also gives a sense of the war’s immense scope. The wide range of ethnographic artifacts include a war club from the Philippines, a grass skirt from New Guinea, and a miniature totem pole from Alaska. Bow of PT 796, with shark teeth. Moored nearby is the destroyer USS Joseph P. Kennedy, Jr., named in honor of JFK’s older brother, who died during a top-secret air mission (Operation Aphrodite) in August 1944. Constructed at Quincy, Massachusetts, and commissioned in December 1945, the Kennedy just barely missed World War II. However, she saw extensive service during the Cold War, most notably during the Korean War and the 1962 Cuban Missile Crisis. The ship contains exhibits about the role of destroyers in U.S. Navy history and also serves as the Bay State’s official memorial to its citizens killed in Korea and Vietnam. Moored next to the Kennedy is a Balao-class submarine, the USS Lionfish (SS-298). Completed in Philadelphia in 1943, the Lionfish conducted its shakedown cruise in New England waters and then saw action in the Pacific on two war patrols, battling Japanese ships and rescuing downed American fliers. She has been at the museum since 1973. The main attraction is the 35,000-ton battleship USS Massachusetts. “Big Mamie” was constructed at Quincy and commissioned in May 1942. She did not have to wait long to see action. In November 1942, the Massachusetts took part in Operation Torch, the Allied invasion of North Africa. Off Casablanca, Morocco, she engaged in a duel with the Vichy French battleship Jean Bart, still under construction in Casablanca harbor; the Massachusetts won. She then headed to the Pacific and played a role in some of World War II’s greatest battles, including Leyte Gulf and Okinawa. Decommissioned in 1947, the Massachusetts was destined to be sold for scrap until Bay State children raised enough money to save her. She was brought to Fall River in 1965. Standing on the deck of a battleship is an awe-inspiring experience. Walking onto the Massachusetts’ 680-foot deck and looking up at its massive 16-inch guns–more than 60 feet long and pointing skyward–one cannot help but simply say: “Wow!” Having been decommissioned so soon after the war, the ship has changed little since its days in combat. Indeed, scars from the ship’s duel with the Jean Bart are still evident. Numerous pock marks, accentuated with red paint, mark where a Vichy French shell hit her on the morning of November 8, 1942, some of the first shots fired at Americans in the fight against Hitler. 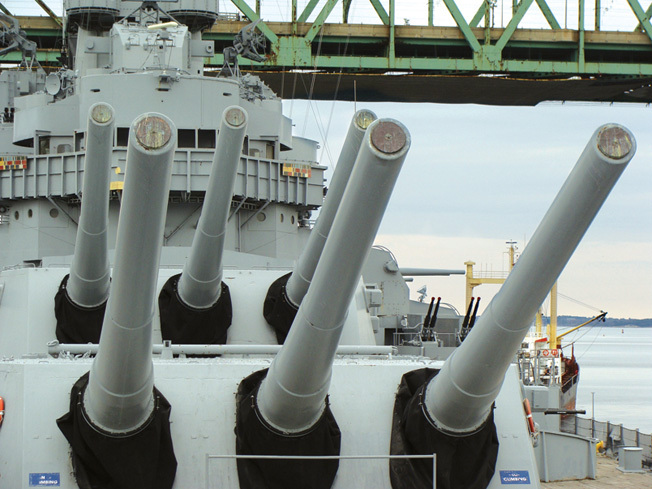 The impressive 16-inch main guns of the USS Massachusetts. The interior of the ship is like an entire city encased in steel. Indeed, during the war it was home to more than 2,000 men. Many rooms are left much as they were during the war. Walking through the main galley, the sick bay, the machine shop, and even the brig gives one an intimate sense of the sailor’ workaday environment. Those interested in naval combat will also want to explore the barbettes––the massive circular structures that protect the workings of the 16-inch guns. Video monitors play interviews of the ship’s veterans, further enhancing the experience. Many portions of the Massachusetts have been converted into museum exhibits covering a wide range of World War II topics, from Pearl Harbor to Rosie the Riveter. Battleship Cove bills itself as “the world’s largest naval ship museum,” and the ships certainly are magnificent. While some of the museum exhibits seem rather careworn, they still successfully capture the experience of the American sailor in World War II, with all its joys and hardships, heroism, and sacrifices. January 1-March 31, 9:00am-4:00pm – Friday – Sunday. The museum is closed on Thanksgiving, Christmas, and New Year’s Day.